I am trying to build a plan to have this car running and driving for the Hot Rod Power Tour this year, or at least the Woodward Dream Cruise in August. From looking at my turn radius I need to shorten the front steering arms for the rack and pinion travel to work. The question I have is, is it a horrible idea to drill the stock arm for a shorter arm? I plan to use heim joints with a through bolt and spacer. This is from another FAQ thread, the one I based my e21 rack on. The more I have thought about this the more i do not like the idea of cutting and welding the steering arm. 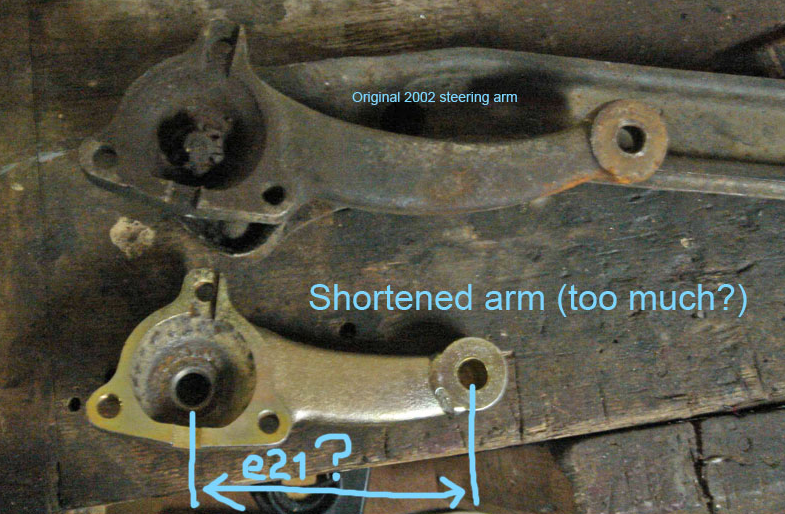 The through bolt i would use is similar to the 2002 in shaft size. That would leave me with roughly the same cross section of material on either side of the hole. In my mind this is less risky than the cut and weld. The reason for the change is simply because the rack i have does not have enough travel to give me the same steering angle as stock. Before it's asked i have to go to a rack to gain clearance for the engine swap. Next entry Forward progress that looks like going backwards??? I wouldn't think it would be any issue with it since you aren't using a typical tie rod end. If it were the typical tie rod end I would say it needs to be cut and welded because of the taper. But if you are using a heim joint, it should be just a straight hole. Just make sure you don't get the metal too hot when drilling it. Just make sure to match the stock Ackerman and you should be fine.